The Baja Bumpers Ford Ranger rear tube bumper will fit all 1993-1998 Rangers. It is available with or without a receiver hitch; this hitch is not rated for towing. As with all our products, this bumper is a fully functional off-road bumper meant to withstand the rigors of the true off-roader, and can be installed in under an hour with only hand tools (no cutting or welding required). 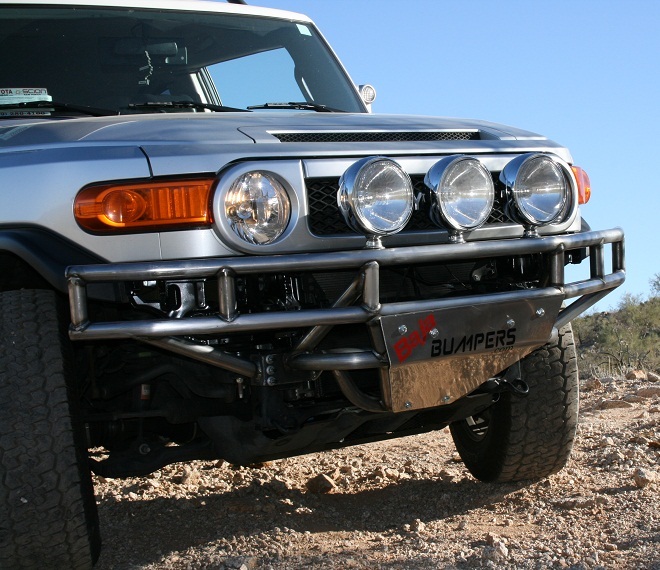 The Baja Bumpers Ford Ranger front tube bumper will fit all 1993-1997 Rangers. 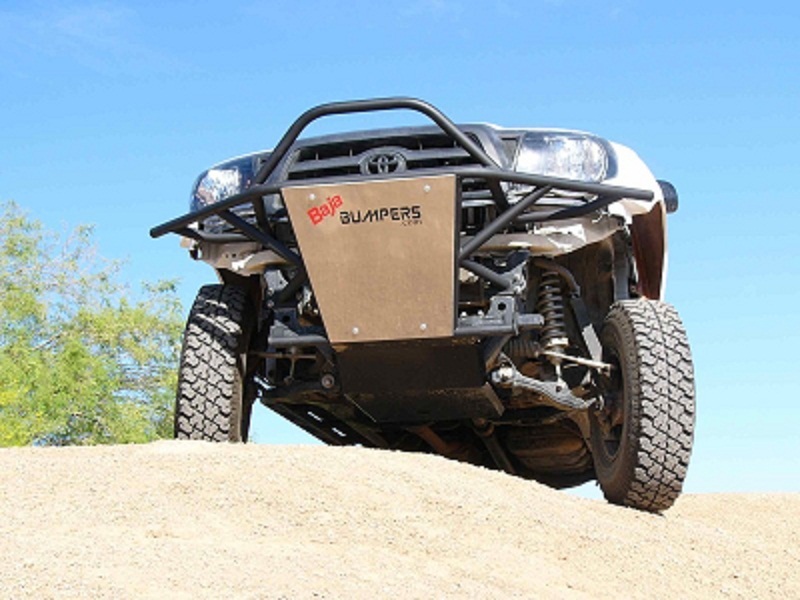 As with all our products, this bumper is a fully functional off-road bumper meant to withstand the rigors of the true off-roader, and can be installed in under an hour with only hand tools (no cutting or welding required). The Ford Ranger front bumper comes with a top bar and 2 light tabs that will accommodate 6” lights or no top bar and 3 light tabs for up to 10” lights. It comes with the 1/8” aluminum skid plate. The Baja Bumpers Tacoma/4Runner front winch tube bumper will fit all 1995-2004 2×4, 4×4, or PreRunner Tacoma’s, as well as 4Runners. This bumper is not just for looks, it is a fully functional off-road bumper meant to withstand the rigors of the true off-roader, and can be installed in under an hour with only hand tools, drilling of a ½” hole is required (no cutting or welding required). This winch bumper is designed to use the low profile 8,000 to 10,000 winch (winch not included but available upon request) and has mounting features for a Fairlead and comes with 2 clevis attaching mounts (clevis not included). 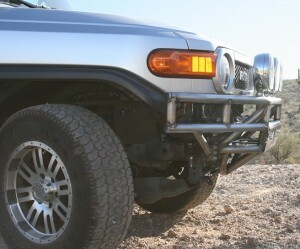 The winch bumper is designed with wrap around ends for fender protection. Some models of Tacoma’s will require a frame extension (extension is included). The front bumper is designed for frontal protection from rocks, brush, and debris, and extends 4″ below the frame to protect the radiator as well. It is available with either two light tabs and the light guard bar or three light tabs and no bar (this will accommodate up to 10″ lights, without blocking the stock headlights). All the tubing is 1 5/8″ x .120 wall mild steel (HREW). The front skid plate is 1/8″ aluminum plate and is included with the front bumper. The bumper mounts to the bottom of the frame with four bolts, and with two bolts (included) through top of frame, and your original hardware. 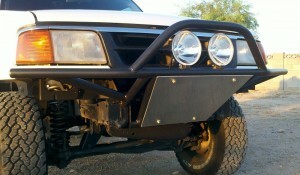 These Baja Bumpers are designed to give you that “Don’t mess with me” look you want and bolt on installation you need. You will need to add front turn signals, as they are mounted in the stock bumper. This bumper is for off-road use, is not DOT approved, and like all off-road equipment, USE AT YOUR OWN RISK. Our new one piece Extended Skid Plate allows you to have a single aluminum plate from the top front all the way to the first cross-member for extra radiator protection. This only works with your stock skid pan removed. This skid plate does not extend to cover the oil pan. This skid plate will also work with your existing Baja Bumper. This kit comes with all the pieces you will need to convert the front corner lights to turn signal marker lights. Once you remove your stock front bumper you will no longer have front turn signals. Follow our simple how-to instructions and you will be done in less than 30 minutes. You will need a die grinder or something to enlarge the hole in the plastic light. Check it out in our “How-to” section. The Baja Bumpers Tacoma rear tube bumper will fit all 1995-2004 2×4, 4×4, or PreRunner Tacomas. It is available with or without a receiver hitch, and also has an available removable spare tire carrier. As with all our products, this bumper is a fully functional off-road bumper meant to withstand the rigors of the true off-roader, and can be installed in under an hour with only hand tools (no cutting or welding required). The rear bumper is designed to protect the body from the rear, as well as add functionality. This bumper is made from all new materials, MIG welded, and includes a license plate light/mount. All the round tubing is 1 5/8″ x .120 wall, and the rectangular tubing is 1″ x 2″ x.120 wall, all mild steel (HREW). It is designed to give you that tough custom look, with a 30 minute*, bolt on, no drilling installation. This bumper is for off-road use, is not DOT approved, and like all off-road equipment, you use it at your own risk. The Baja Bumpers Tacoma/4Runner front tube bumper will fit all 1995-2004 2×4, 4×4, or PreRunner Tacomas, as well as 4Runners. This bumper is not just for looks, it is a fully functional off-road bumper meant to withstand the rigors of the true off-roader, and can be installed in under an hour with only hand tools (no cutting or welding required). The front bumper is designed for frontal protection from rocks, brush, and debris, and extends 4″ below the frame to protect the radiator as well. It is available with either two light tabs and the light guard bar or three light tabs and no bar (this will accommodate the 8″ or 9″ lights, without blocking the stock headlights). All the tubing is 1 5/8″ x .120 wall mild steel (HREW). The front skid plate is 1/8″ aluminum plate and is included with the front bumper. The bumper mounts to the bottom of the frame with four bolts, and to the core support with two bolts, using all your original hardware. These baja bumpers are designed to give you that “Don’t mess with me” look you want, with the 30 minute*, bolt on, no drilling installation you need. You will need to add front turn signals, check out our turn signal conversion kit, as they are mounted in the stock bumper. This bumper is for off-road use, is not DOT approved, and like all off-road equipment, you use it at your own risk.